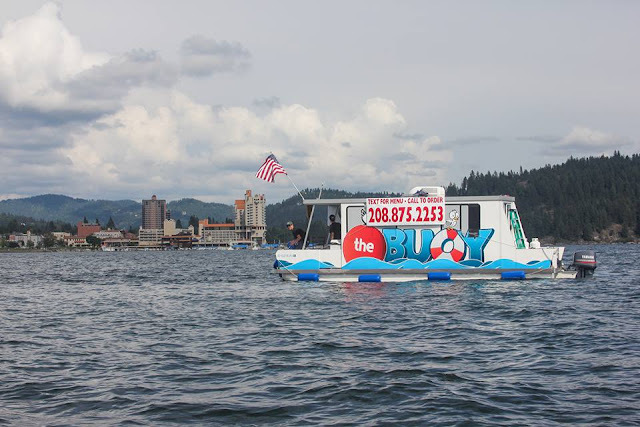 That new business is , The Buoy , and it's a new restaurant that serves food from a kitchen on board a small houseboat floating on Lake Coeur d' Alene. The Buoy serves the many other boaters out on the Lake for various locations, all on Lake Coeur d' Alene usually near the city itself. Ordering from The Buoy is easy as all you have to do is send a text message to 208-875-2253 and they quickly send you back a menu. Then you call that same number to place your order, dock against the front of The Buoy to pick your food up when it's ready. The Buoy offers a short but great menu of sandwiches, burgers ,tacos, hot dogs and quesadilla's. Chips, soda, bottled water and ice cream are also available.